In enterprise Java application development, perhaps Spring and Hibernate integration is one of the most-demanded topic which most programmers are looking for and are facing with. Spring is the leading enterprise application framework, and Hibernate is the leading ORM framework so combination of these two guys would be a preferable choice in order to develop robust enterprise applications. This is a step-by-step tutorial that helps you build a Spring-Hibernate application easily in a clear and concise way. 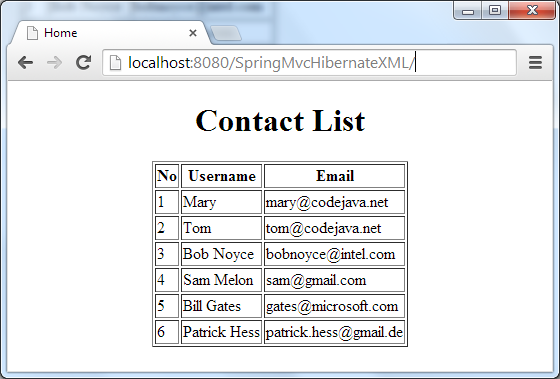 In this first part, we demonstrate how to code a simple Spring MVC application that displays a list of users from MySQL database. The DAO implementation uses Hibernate’s SessionFactory to query against the database, instead of usingJdbcTemplate. Spring MVC: Annotations for controller and XML for bean definitions. Hibernate: XML mapping for model class. Web Application: using web.xml deployment descriptor file. LocalSessionFactoryBean : creates a Hibernate’s SessionFactory which is injected into Hibernate-based DAO classes. HibernateTransactionManager : provides transaction support code for aSessionFactory . Programmers can use @Transactional annotation in DAO methods to avoid writing boiler-plate transaction code explicitly. Let’s see how these concepts are implemented in a real project. Let’s create a Spring MVC project using Spring Tool Suite IDE (See example:Spring MVC beginner tutorial with Spring Tool Suite IDE ), name it asSpringMvcHibernateXML . Remember to insert some dummy data for testing purspose. NOTE: After completing this tutorial, you will create a project structure looks like the above. NOTE: You can see the whole content of pom.xml file in the attached project. This model class is used to map the table users and the database to a plain-old Java object (POJO). NOTE: For more information about Hibernate XML mapping, see: Hibernate One-to-Many XML Mapping Example . This Hibernate configuration file declares which resources need to be mapped (theUser.hbm.xml file in this case). This interface declares only one method list() that retrieves all users from the database. Notice in this class, a Hibernate’s SessionFactory object is injected via constructor by Spring. The list() method simply obtains the current session from theSessionFactory and queries for a list of all users in the database. Pay attention to the @Transactional annotation provided by Spring - when a method is annotated by this annotation, Spring will inject transaction support code into the method - thus we don’t have two write any code to handle transaction explicitly. Now, we come to the most important part that wires Spring and Hibernate together through some XML configuration. Open the servlet-context.xml file undersrc/main/webapp/WEB-INF/spring/appServlet and update its content as follows. NOTE: Change database URL, username and password according to values in your environment. This data source will be injected to a SessionFactory bean below. Note that this LocalSessionFactoryBean requires a DataSource bean which is declared previously. The configLocation property specifies where Hibernate configuration file will be searched for. In this case, it is the hibernate.cfg.xml file in the classpath. As mentioned in the UserDAOImpl class, we can specify transaction support by using the @Transactional annotation for transaction-aware methods. This bean will be then injected to a Spring MVC controller class which is described below. NOTE: For the whole content of Spring application context configuration file, see the corresponding file in the attached project. Here, an implementation of the UserDAO is injected automatically by Spring (because @Autowired annotation is used). Remember the UserDAOImpl bean we declared in the Spring application context configuration file previously? It is injected to this controller automatically so that the handling method home() can use it to list all users from the database. And eventually, the home() method returns a view namedhome which is resolved an actual JSP page which is described below. This JSP page simply displays a list of users which is passed by the controller, by using JSTL tags. Congratulations! 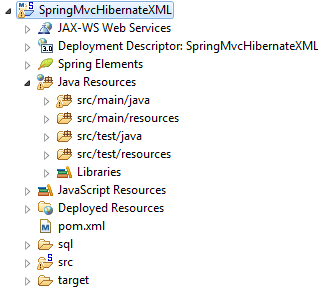 You have completed our first part of Spring-Hibernate Integration series. You can download the attached project and experiment yourself. A deployable WAR file is also provided for your convenience.